The list of suitors for embattled automotive safety products supplier Takata Corp. is expected to be reduced to two following a meeting in New York or Detroit at the end of this month. All 15 of Takata's major customers, including the Detroit 3 automakers, Takata executives and its advisory firm Lazard Ltd. and bidders are expected to determine the future of the Japanese supplier, which has been hammered by the largest recall in automotive history, according to a source familiar with the bidding. The group will whittle the bids from four suitors down to two, as the auto supplier edges closer to insolvency. The meetings are expected to be in New York, but executives from the local automakers have asked to move the agenda to metro Detroit. Suitors for the Tokyo-based supplier of seatbelts and airbags include U.S. competitor Key Safety Systems; Daicel, a Japanese manufacturer of airbag inflators that's jointly bidding with private equity firm Bain Capital; Flex 'N Gate and Swedish airbag maker Autoliv, according to Bloomberg reports and the source familiar with the matter. The bid from Daicel and Bain Capital is for more than 300 billion yen ($2.9 billion), Reuters reported. 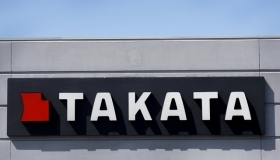 It is backed by Takata's steering committee of Japan-based lawyers and consultants, said a person involved in the process and one who was briefed on the matter. That is the highest bid for Takata, the source briefed on the matter told Reuters. Previous bidder KKR & Co., a New York private equity firm, is believed to have been eliminated from the running, one source told Crain's Detroit Business, an affiliate of Automotive News Europe. The suitors are currently meeting with Takata's customer base to make their case, the source said. Automakers are leaning towards Autoliv, the world's largest supplier of airbags, which has ramped up its production capacity of airbag inflators to provide replacements parts as Takata has struggled to keep up, said a source briefed on the matter told Reuters. While the acquisition of Takata doesn't need formal approval from the automakers, they have a vested interest in ensuring the buyer can continue to provide the industry with the airbags needed to keep production lines moving -- and any buyer would want assurances the automakers would remain customers. Toyota Motor, Honda Motor, Nissan Motor and Volkswagen will attend the meetings, Reuters reported. The bids, which all fall in the range of $1 billion to $2.9 billion, include the use of Chapter 11 bankruptcy protection in the U.S. It's unclear whether the Japanese business unit would also file for bankruptcy in Japan. The concern is whether Takata's new owner and its customers can indemnify themselves from the massive liability costs attached to Takata's faulty airbags -- which are estimated at more than $24 billion. Last week, Takata hired New York law firm Weil Gotshal & Manges, one of the largest mergers and acquisitions firms in the U.S. The hiring is generally viewed as preparation for a sale and bankruptcy filing. Takata is floundering under the biggest recall in automotive history. As many as 100 million vehicles worldwide may ultimately be recalled due to faulty Takata airbag inflators linked to 16 deaths and more than 100 injuries, according to Bloomberg. The airbag inflators can explode, shooting shrapnel into the vehicle's interior. In September, Takata sold its U.S. interiors subsidiary, Irvin Automotive, to Detroit-based Piston Group for $175 million.